It can’t get any better. 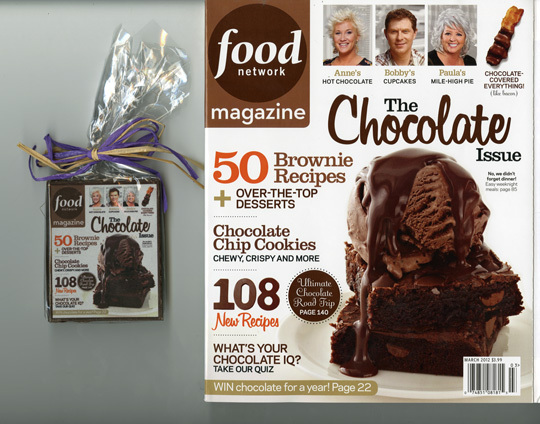 The March issue of Food Network magazine is The Chocolate Issue. It arrived earlier today via next day air from the magazine’s publisher Vicki Wellington (see my interview with Ms. Wellington here). The reason for the speedy delivery? The issue came with a “mini chocolate treat” with the cover design on the chocolate treat. What more interactivity can you ask from a magazine? One to read and one to eat. Thank you. Vicki Wellington to Samir Husni: Food is on Fire. People Who Don’t Even Like to Cook Love Food Network. Mr. Magazine™ Interviews the Publisher of Today’s Hottest Magazine: Food Network Magazine. Vicki Wellington does not have to twitch her nose to bewitch you. The publisher of the Food Network Magazine, for whom Darren/Larry and the men at the ad agency from Bewitched were her “role model” growing up, is flying high with the most successful and hottest new magazine since 2009. Unlike Samantha, Wellington does not need a flying broom or a magic carpet to engage her customers with the hottest magazine on the marketplace today. All she needs is to feed the addiction of the American public to “food” and “celebrities.” Add a dash of pixels on a screen (make that a lot of screens) and a pinch of ink on paper (make that a lot of papers) and the result will be the Food Network Magazine –– led by the hottest, passionate and energetic magazine top chef Vicki Wellington. The smile never departs from Vicki’s face. You could feel the vibrating energy radiating from her every time she mentions the magazine, the Food Network, the customers, the advertisers, the company and above all “her lean and very able staff.” To say she loves her job will be an understatement. She is as affectionate talking about the magazine and her job as her customers are affectionate about the magazine and the network behind it. It is a story of success second to none in today’s magazine world. It is a hot, hot, hot magazine and, of course, magazine publisher. Watch below my interview with Vicki Wellington, publisher of the Food Network Magazine, followed by the sounds-bites of the interview and then read the entire (lightly edited) transcript of the interview. On the secret of Food Network Magazine success: An amazing brand, a super, powerful surround sound position in the market, and a beautifully translated magazine in print, great photography, great design. It’s big, it’s growing, and we’re reaching the right types of people with the right kind of edit. The minute it came out on the newsstand, as you know, it flew off the newsstand. Food is on fire. So in our country, people who don’t even like to cook love Food Network. 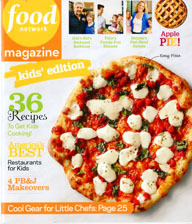 We’re creating a mini magazine called Food Network Magazine for Kids and it will run in our September back-to-school issue. 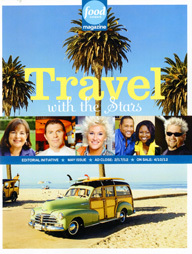 We’re creating in the May issue Food Network Magazine Travel, all edited through the eyes of our celebrity chefs. On Vicki Wellington: I’m pretty happy here. It’s a pretty happy place. We have a great brand, we’re on fire; we really are. On what keeps her up at night: Not having enough hours in the day. And now, for the lightly edited transcript of the Mr. Magazine™ Interviews with Vicki Wellington, publisher of the Food Network Magazine. Samir Husni: The Food Network Magazine has been one of few success stories we’ve seen in the last few years. What do you attribute that to? Vicki Wellington: An amazing brand, a super, powerful surround sound position in the market and, as we just talked about, a beautifully translated magazine in print, great photography, great design. Food Network, as I said, has power on its own, plus the entertainment piece of it is absolutely non-stoppable. It’s a consumer favorite and that’s the lead point on all of it. Vicki Wellington: I don’t think so. I think that twenty years ago you didn’t even have a celebrity chef, now Food Network literally as a brand has created all these personalities. There’s young, there’s old, there’s someone for everyone. And as you know, we’ve had the TV for many, many years and we’ve got digital for many, many years, both very successful in their own right and we have many other pieces of the brand that surround sound a consumer, but consumers said they wanted this magazine. The minute it came out on the newsstand, as you know, it flew off the newsstand. We hit a million in circulation literally in 4 issues, which, as you know, is unheard of. Right now today, we’re at about 1.58 million over delivering, since we started, over 7 million readers. So I think this is the real deal. Samir Husni: And you know your critics will say, ‘Well, you know, it’s because of the television the magazine is succeeding.’ Yet Hearst has ventured before into this area and published a magazine called Lifetime, which did not last long. Vicki Wellington: I wasn’t here for that. That was obviously a whole different entity. I think for us, all of the stars are aligned here. Food is on fire. So in our country, people who don’t even like to cook love Food Network. I think again, this brand has something very special about it, and as we discussed, the interpretation of the brand. I think this is, obviously, a very different proposition. And from what I’m seeing, I think I told you, our Jan-Feb issue just did terrific on newsstand, and that’s not usually one of our biggest selling issues. The content, as you know, is completely integrated, 360, and of course, we do the same for advertising, there’s not a lot of brands, I don’t think there’s any, other than maybe one other, that can actually deliver that. Vicki Wellington: Yes, yes, you’re very good with your rumors. I don’t know where you learned these things from, but we’re doing Food Network Magazine for kids, which is very exciting. I think I mentioned that literally over 12 million kids are watching Food Network programming, which is a huge amount. And we get letters all the time from women who read the magazine, we actually have more women readers than Real Simple has women readers and they’re cooking with their kids every single month. So we’re literally creating a mini magazine called Food Network Magazine for Kids and that will run in our September back-to-school issue and the consumers are really excited about it. Samir Husni: And what about the travel magazine? Vicki Wellington: Travel, another thing. When you go on vacation, I don’t know how the food is in Lebanon, I bet it’s good, but when people travel, it’s food-focused. If you go to Italy, it’s about the food. And so what our editors are doing, are creating in the May issue, Food Network Magazine Travel, all edited through the eyes of our celebrity chefs. So you’ll see Guy’s favorite…let’s say, breakfast haunt in San Francisco and where he recommends going and the hotel that he would recommend staying in, so it’ll be a lot of fun, it’ll be exciting and again, all edited through all of the various chefs eyes. Samir Husni: Any downfalls? I mean, it sounds like one big success story after another. Vicki Wellington: I’m pretty happy here. It’s a pretty happy place. We have a great brand, we’re on fire; we really are. Samir Husni: So what keeps Vicki up at night? Vicki Wellington: You always ask me that question. Honestly, and you laughed the last time I answered it, but it’s the truth; not having enough hours in the day. And that really is the truth. I wish there were more hours; we could be doing more work. You see what we put out, with a pretty lean team every single month. And we’re proud of all of it. But there’s not a lot to worry about, we’re excited. It’s big, it’s growing, and we’re reaching the right types of people with the right kind of edit. So it’s all good. Jack Haire to Samir Husni: Sunday Newspapers Are Doing Quite Well and So Are Parade and Dash magazines… The Mr. Magazine™ Interview with the CEO of Parade Publications on The Power and Reach of Print. The man who believes in newspapers is putting his money where his mouth is. 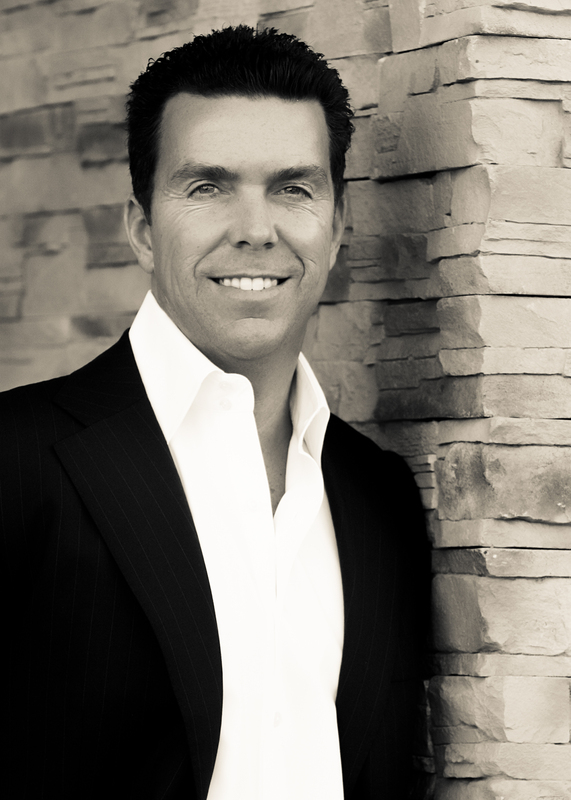 Jack Haire, CEO of Parade Publications, publisher of the mother of all newspaper-distributed-magazines, Parade, and its newest sibling, Dash, has managed to do what only a few managed in this “digital age”: he increased the circulation of one of America’s already largest circulated ink on paper magazines. Parade has increased its circulation by 600,000 copies to reach 32.5 million copies distributed weekly. No, this is not a typo, Parade magazine distributes a total of 32.5 million ink on paper copies every single week inside the pages of some 630 different newspapers every Sunday morning. Click on the video below to hear his answer and the answers to other questions related to Parade, newspapers, the future of print, and of course, what keeps Jack Haire up at night. On the future of magazines distributed via newspapers: There are still a 100 million Americans that read newspapers. On an example of the health of Sunday newspapers: The Minneapolis Star Tribune, one of Parade’s newest partners, their Sunday editions, their most important day, are actually growing by 6 percent. 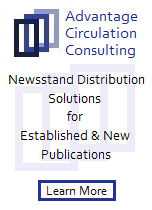 On Parade’s circulation: We increased our circulation this year. It’s all tied into distribution agreements and promotional agreements, but our circulation increased by 600,000 this year. On the future of newspapers: The tale of the newspaper world and the innovation that is happening in that world is really a fascinating story and it’ll go on for a long time. On the mission and role of Parade: Parade celebrates all that’s good in America, it brings a smile to people’s faces when they hear about Parade. On his future plans for Parade: I hope to continue to see us grow and maybe launch something else before the end of this year. On what keeps him up at night: I want Parade to be a great place to work. That’s a tall enough order in a tumultuous town. Samir Husni: One of the many things people wondered when you launched Dash, and revamped Parade, was “What’s plan B?” They said newspapers are dying, those people that are launching magazines that are going to be, or are inserted into newspapers… are they out of their minds? Jack Haire: I’m not sure of the answer to that question, Samir. I don’t think so. There are still a 100 million Americans that read newspapers. It’s a huge audience of people searching for news, well-educated, and Sunday newspapers are actually doing quite well. Your old friend Mike Klingensmith, founder of Entertainment Weekly and publisher and president of Sports Illustrated, CFO of Time, Inc. is now the CEO of The Minneapolis Star Tribune, one of Parade’s newest partners. Their Sunday editions, their most important day, are actually growing by 6 percent. Across Parade’s 630 newspapers are sort of same-store sales, only to climb by one half of one percent across 630 newspapers, 32.5 million in circulation. We increased our circulation this year. It’s all tied into distribution agreements and promotional agreements, but our circulation increased by 600,000 this year. I think long before I go on to meet my maker these newspapers are going to be around and we’re in arguably the best in the country that provide a huge service to their community, and will they change? Surely, and in already 22 or 23 of the top 25 markets, the largest local site is the newspaper site, so we syndicate our contact for Dash and Parade across 500 of those newspapers now and reach an audience online of 50 million people. The tale of the newspaper world and the innovation that is happening in that world is really a fascinating story and it’ll go on for a long time. Samir Husni: Parade is such a big brand, such a recognized household name. Any plans to expand the brand from outside the newspaper, any plans to do a Parade book or a monthly magazine on the newsstands? Jack Haire: We have a lot of plans. We’ve tried to stay focused on when we build a digital business that we not only build it ourselves with the parade.com domain, but we build it in partnership with these 500 newspapers, so you want to be good at what you’re doing so before you go to the next thing, it’s important that you make sure Dash is successful. Tracey Altman has done a very nice job at that. We were happily named, by a fellow by the name of Samir, as one of the launches of the year, which we’re incredibly proud of, all of our people, but we were also profitable last year in our first year of not being fully monthly…we were published 11 times and we made a little money. So yes, do we have plans; absolutely. Parade celebrates all that’s good in America, it brings a smile to people’s faces when they hear about Parade. I remember reading Parade, I remember seeing it at my house when I was growing up, whatever town it might be. There’s a lot of great history, we feel that we can do some really interesting special interest publications that are digital only, some apps surrounding our personality at Parade, thematically around certain important holidays, and I also think that we can create some big, stand-alone publishing issues that we can distribute with a number of our key partners. I’m really excited about that and I’m excited about getting at them and I’m excited about getting at them this year. You know last year was such a challenging year in some ways that I want to make sure our base is really solid, but I hope to continue to see us grow and maybe launch something else before the end of this year. Samir Husni: Last question, what keeps Jack up at night? Jack Haire: A lot of things, I think. I came to Parade… I don’t know how old I was when I came to Parade… I was 56…been here 2½ years. I’ve worked at a number of other places and I really, really like the people here. I’m blessed to work with our editor, Maggie Murphy, the woman next door, Alice Werner, some very talented publishers, Brett and Tracey, and a 150 other folks. So I want to make Parade… I want to develop it into all that it can be; I want it to be successful in multiple platforms. And I want these people to learn the trade and the trades well here, so they can go on to enjoy a really successful career at other places and I want Parade to be a great place to work. That’s a tall enough order in a tumultuous town. David Carey is the eternal optimist. The president of Hearst Magazines has his fingers on the pulse of the magazine industry. His prescription for an industry’s cure was outlined in his New Year’s letter to Hearst employees in which he stressed the need and importance of both the ink on paper and the pixels on the screen new magazine media business model. I had the opportunity to visit with Mr. Carey last week in his office on the 43rd Floor of the Hearst Tower on 8th Ave. in New York City. After a brief chat on the status of industry in general and Hearst in particular, David was generous enough to share with me on tape some of his ideas and practices regarding the magazine industry now and in the future. I asked David what keeps him up at night and his answer surprised me as I am sure will surprise some of you, if not all of you interview readers and watchers everywhere. Watch the edited video interview with David Carey below, followed by the typical Mr. Magazine Interviews™ soundbites and the transcript of the interview. On the mix between established titles and new ones: There is always room to both revitalize an existing product and as well as to especially create new ones. On the reasons behind enhancing their print magazines: We do want to be best in class in all of our titles. On the creation of a “backlist” single copy business: About 30 percent of our single copy sales are for issues that are no longer available for sale on ink and paper. On the tablets’ threat: We don’t see that all these new devices have any significant cannibalization on the print form; they tend to bring in incremental new readers. On costs and spending: We have to really focus on pulling out all of the unnecessary costs that are invisible to the end-users. On what keeps him up at night: We have to compete against a swarm of entrepreneurs. Samir Husni: You’re the eternal optimist. I mean, every time I read anything you’ve written, anything you’ve talked about, you have always seen the industry’s cup as more than full, or half full. After being the president of Hearst Magazine for eighteen months, do you still believe the industry’s cup is more than half full? David Carey: Absolutely; in the U.S., but especially around the world. In the U.S., we were just chatting a moment ago for those that just joined us, about the success of HGTV and this is our latest magazine test. So you read every day in the newspaper about housing woes and all the issues in the housing market, but here is a product, HGTV, all around home and garden television, that’s an enormous positive response by consumers, to a fresh new product that found white space that otherwise was difficult to find. So there is always room to both revitalize an existing product and as well as to especially create new ones. It’s not without their risks. But if you have a good brand, a good promotion planned, it is still within success. And all of the new devices, in a world where there won’t just be a tablet in every home, but there will be five tablets, and nooks, and kindles and so on, that people have opportunities to consume our content with so much greater frequency and you think about having dinner with a friend and they mention a great article in Esquire, and then you have to remember the newsstand, or the bookstore, the airport to buy it, and you might forget, now you go home and open up one of your devices and you buy it, and it shows up a minute later. So in terms of technology, it takes all of the friction out of the consumer experience and allows people, when they hear about something, to immediately be able to activate. And what a great thing for us, not only for our current products, but also as a big magazine publisher, we sit on these vast archives of content and it’s been hard for us to create new products and make money from. And one of the interesting stats that we’ve learned about our tablet business today is about 30 percent of our single copy sales are for issues that are no longer available for sale on ink and paper; so if you want the July issue of Cosmo and you can’t find it easily, you can still buy it, it’s still valid, still relevant, and it still pays off. And so we get an opportunity to create a backlist for content in a way that’s always driven the book industry, which has front list and back list titles. We’ve only been in the front list business, so we have all these new opportunities that have been created literally in the last 12 months. Samir Husni: In your letter to the employees at the beginning of the year, you emphasized the focus that Hearst Magazines is going to be growing in both print and digital, and your latest enhancement of print is the February issue of Harper’s Bazaar where you upsized the magazine, something that you have been doing for the last few months with the rest of the magazines. 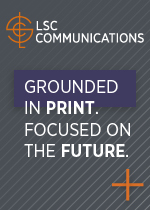 Do you see any major change that’s going to take place, in terms of whether print will become rarer in the future, digital will be everywhere, the tablets will take the place… Why are you still investing in print? David Carey: We don’t see that all these new devices have any significant cannibalization on the print form; they tend to bring in incremental new readers. So that’s a real positive. We are investing in a number of our editions because we do want to be best in class in all of our titles. We do know that as far as advertising, we want to be, ideally, one, two, maybe three, in terms of a category, you don’t want to be four or five. The old Jack Welch rule, about number one or number two or go home is certainly in place. So if there are places where we feel that we should not chop and we should be more competitive, we’re going to make an investment in them and sometimes it’s in the number of edit pages, sometimes it’s in the paper stock, or sometimes it’s in the photography. Then at the same time, I’ll be honest, we’re being very aggressive and looking for efficiencies that consumers don’t see. A lot of our work we’re off-shoring, in terms of production process, so the notion of what the consumers touch and feel has to be better than ever. But we have to really focus on pulling out all of the unnecessary costs that are invisible to the end-users. Samir Husni: One final question: What keeps David up at night? David Carey: Wow! Well, in our case, we are so fortunate to work at Hearst…this great company at this moment in time, but I do know that everyday in scores of the proverbial garages, in Silicon Alley and Silicon Valley, you have entrepreneurs who wake up wanting to take down News Corp, Advance, Time Warner, and Hearst, and they do so fearlessly, and they do so by not following normal rules and orthodoxies of what can and can’t be done. So the only thing that I really worry about is we have to compete not against the other big multi-nationals, I think we know how to do that, we have to compete against a swarm of entrepreneurs; so how can we have a company of enormous scale, but have that scale aid us and not get in the way. That’s what we think of everyday, how to be large and nimble, blessed with so much talent with the ability to move fast. If we can achieve that then that’s a significant accomplishment. A Rebel (Magazine and Man) with a Cause? The Mr. Magazine™ Interview with Rick Cabral, CEO of Rebel Media, LLC. Do you have what it takes to be a rebel? Well, you can easily say yes if your name is Rick Cabral, CEO of Rebel Media, LLC. and publisher of Rebel magazine. The magazine is on a mission and so is the CEO of the company that publishes it. Started by a group of men with no prior publishing experience, one of Rebel’s mission “is to have men ask deeper questions about their life purpose and their interdependence to others.” A noble mission, but not an easy one to execute. However, Mr. Cabral, a rebel with a cause, is determined to make a go from the magazine (and all the additional channels) regardless of the hurdles and is enhancing Rebel’s business plan to ensure it is well set for the future. On the purpose of Rebel magazine: To shine a spotlight on some of the false masculine stereotypes and behaviors, or thought processes that have become accepted cultural norms for men today. On the publishing industry today: The publishing industry is fraught with land mines – particularly for a self-published men’s magazine, launched in this tough and prolonged economic downturn. 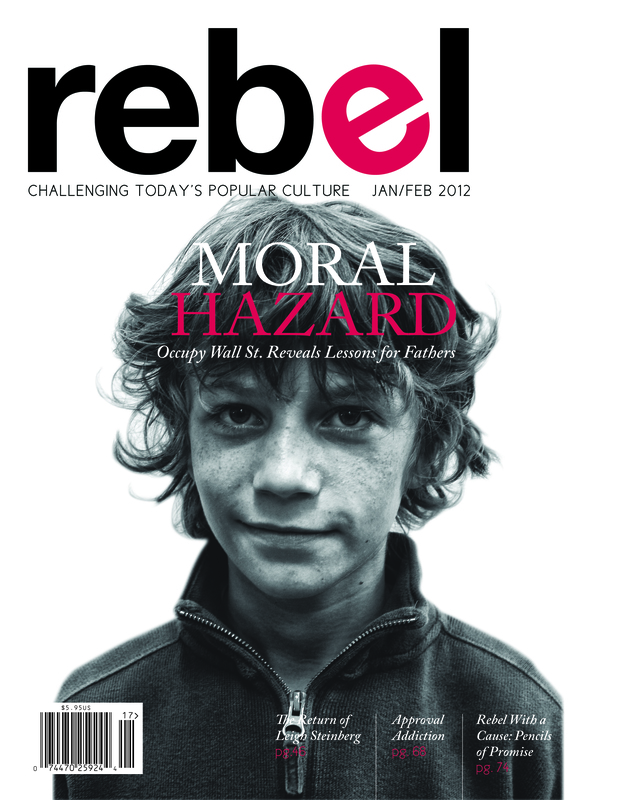 On the business model of Rebel: Until 2012 – Rebel took no advertising revenue, we provided free advertising space to our growing base of charitable and brand partners – some of which were very well established, while others were in need of, and deserving of, a voice in our publication. On who Rebel is: Someone who represents human imperfection and all the truth that statement implies. On the toughest hurdle so far: The most difficult challenge for us at Rebel has been without a doubt…distribution. And now for the entire interview with Rick Cabral, CEO of Rebel Media, LLC. Samir Husni: When you hear the word Rebel, you do not think of a magazine devoted to fathers and fatherhood… What is the story behind Rebel? Rick Cabral: Well to be honest, Rebel is much more than a magazine about fathers, although fatherhood and the responsibility associated with that title, grace the pages of the publication frequently and we dedicate a feature piece to “fatherhood” in each issue. But Rebel provides readers a fresh perspective on a variety of topics such as: cultural interests, value based living, social responsibility, career and family challenges, relationships, sports, entertainment and more. Rebel has an interesting history since the founding partners had no previous publishing experience. The magazine and overall mission really began as a response to my partners and I looking for a channel in which to reach men in a more authentic fashion. We hoped to shine a spotlight on some of the false masculine stereotypes and behaviors, or thought processes that have become accepted cultural norms for men today. We thought maybe we could encourage men to examine how they interact in the world, and/or evaluate their broader life purpose. We also hoped to inspire men through “real world” examples of other men, we like to call – ‘Rebels With A Cause’ – who are making an extraordinary impact on the lives of others through their work related endeavors, philanthropy, entertainment, humanitarian and/or cause related initiatives. I guess to sum it up – by examining broader cultural paradigms, personal character and values, relationships, and ethical and moral issues – we hoped to have men asking deeper questions about their life purpose and their interdependence to others. We hoped to inspire individuals to get proactively involved in serving the interests of others before themselves and through our editorial content more accurately represent what men are experiencing in today’s cultural climate. SH: So many other magazines aimed at fathers (and men) were published in the past and with rare exceptions all failed. Why do you think Rebel will have a different future? RC: Well again – fatherhood is only one aspect of our overall editorial – so I think Rebel has a much broader appeal to men in general, when compared directly to publications focused solely on reaching fathers. Rebel is a very unique publication – certainly a dramatic departure from traditional men’s magazines – which have been more focused on external issues such as fitness, grooming or say, fashion. We are not opposed to that per say, but we thought men today are facing a variety of personal and professional challenges in our modern world, and we tried to create a publication that more accurately reflected that. One of the more interesting and unexpected aspects to Rebel since its inception is the response we get from female readers who continue to read and subscribe to the magazine and purchase it for their sons, husbands or brothers – we have a couple of interesting features called ‘VS’, and ‘Women on Men’, in which women have an opportunity to talk directly to our male readers, from their perspective, about a variety of subjects, in a very open and authentic way. Men always want to know what women are thinking anyway, so we thought this would be a great avenue to challenge gender perspectives and positively impact relationships in an sophisticated and edgy format. SH: Funding and lack of advertising have always been cited as the number one reason for new magazine’s failure. How are you dealing with funding and advertising for and in Rebel magazine? RC: Very true – the publishing industry is fraught with land mines – particularly for a self-published men’s magazine, launched in this tough and prolonged economic downturn. It has been a challenge to say the least. Rebel is privately financed, which has given us autonomy to create this type of publication. I’m not sure the same could be said if this magazine were developed under a large media umbrella. But it also has required a different approach to both advertising and/or brand partner relations. Rebel started out with the understanding that we could not succeed operating as an island. We also understood the financial ramifications of starting a magazine, and the distribution pitfalls that come along with it. We were determined to establish “like-minded” partner relationships that would ultimately become win-win situations for all involved. Until 2012 – Rebel took no advertising revenue, we provided free advertising space to our growing base of charitable and brand partners – some of which were very well established, while others were in need of, and deserving of, a voice in our publication. By working together, Rebel has developed new distribution channels and in turn creating brand advocates through each of our partnership communities. Rebel has also taken a unique approach to our brand partners – we are actively pursuing those companies who have committed CSR initiatives and want to showcase them in our publication. We aren’t so much interested in having brands advertise their specific products and services solely, but rather engage with our community and partner communities at a different level, by introducing our readers to their “good purpose” initiatives. This way, consumers begin to see these brands as more than just commodities and more as ally’s in the ongoing struggle to improve our communities, take care of those in need, or find solutions to social injustices where present. Taking that thought a step further and we get to the heart of the Rebel mission outside of the pages of the magazine – that is our service work. Rebel has created a service calendar much like our editorial calendar, and it is being developed as we speak for the remainder of this year. We do this because we believe strongly in the idea of serving others – it is a core mission and we think it is as important as the work we dedicate to the development of our editorial content. By partnering with like-minded brands and charitable organizations, Rebel becomes a catalyst to assist others; not just by talking about solutions but by creating them and engaging directly in their outcome. This is accomplished with the help of our community volunteers, and we thank them for their time and commitment to our cause work. There is so much need out there right now – we are just scratching the surface of our collective potential. Through these Rebel sponsored or co-sponsored initiatives we can bring the power and reach of our brand partners to positively and dramatically impact the lives of others in deeply personal ways. SH: If you have a magic wand to strike the magazine and a human being comes out from the ink on paper pages, who will that person be? Please describe. RC: Well I think the way we would approach that is to say that the individual who walks out of our magazine is someone who represents human imperfection and all the truth that statement implies – because all of us, at our core, are a unique and specific piece of the greater whole. All of us are alike in that fact that we are a work in progress – we have made mistakes we wish we could erase, probably have been the beneficiary of a blessed moment or day, maybe we’ve experienced the gain or loss of loving another, or hope to be someone remembered for the good we brought to those around us. I would like to think the human being who walked out of our pages would look something like the rest of us. You and me, each trying to do the best we can with what we have been given. So eventually we come to some understanding of why we were here. SH: What has been the most pleasant moment in the history of the magazine launch so far? What has been your worst nightmare? RC: Without question the most pleasant moment for our magazine came when we were notified that we had won two Folio Awards back in October. I remember it so vividly, because all of the staff, as well as my partner and I were at a point that we were thoroughly exhausted from the last 12 months since launching our publication. We had submitted one of our magazines to Folio back in May, 2011, and felt that we had created a magazine unlike anything in the industry, however, finding out that we were being recognized on a national scale sent a surge of gratitude through our entire office. The timing of our awards could not have come at a more appropriate time for Rebel. I hate to call it a nightmare, but the most difficult challenge for us at Rebel has been without a doubt…distribution. Being independently published poses obvious financial obstacles that larger publishing houses may not have. With that being said, we have spent a tremendous amount of energy trying get Rebel and its unique content in as many hands as we can. Our print circulation has ranged from 20,000 to 35,000 per issue, and we’re finding that through our combined digital distribution(currently over 500,000) we can effectively and inexpensively reach a fairly large audience. SH: You’ve started in print and now you are adding digital editions on the tablets. What are your futuristic plans? Are you going to be digital only? Both? What about the future? RC: We recognize the landmark shift that is occurring within the publishing industry and the importance of titles to provide their content across all platforms and not just in print. We envision our iPad or tablet digital edition eventually playing a greater role in expanding our circulation and becoming an important revenue stream. Today, print still dominates, while digital supports that. That trend will reverse, and likely sooner than later, our iPad/tablet digital publication will become the primary driver within our model and print will transition into a supporting role. SH: What makes Rick tick and click every morning? What makes you say wow, I love my job! RC: If you were to ask anyone that really knows me they would tell you that it doesn’t take a lot to get me going in the morning. Typically, I am up by 4am and getting on with my day. What keeps me going and makes me say, “I love my job,” is the responses that we get from readers that let us know that what we have embarked on at rebel, is making a difference. So whether it is the 65 year old war veteran who found our magazine at a hospital and immediately offered his assistance in moving our message forward, or the divorced mother from New York City that was so moved by what she read in our magazine and bothered by what traditional men’s media discusses that she bought a subscription as a Christmas present for her 13 year old son. It is these and countless other stories that inspire me to get up each day and try to produce content that will help men become better men; better husbands, better fathers, better friends and/or leaders in their community. I hope that you will find the new website and blogs useful and helpful. 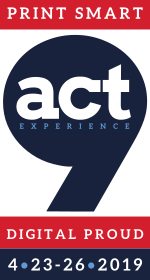 As I always tell folks, we are no longer just content providers, we have to be experience makers. I hope you will enjoy this new experience. The James G. Elliott Co., Inc. Thanks are in order for all the experts and the journalism students at The University of Mississippi’s 2011-2012 magazine class who recorded the interviews. You are currently browsing the Mr. Magazine blog archives for January, 2012.